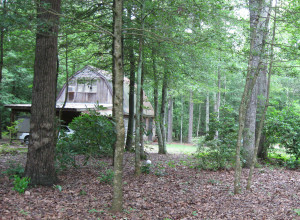 My Woodland Studio is near Snow Hill on Maryland’s Eastern Shore. 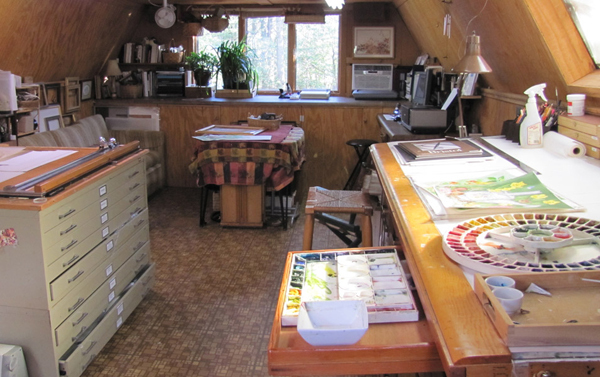 Nestled in the Pocomoke Forest, the studio is set above the workshop and garage so I have a treetop view. 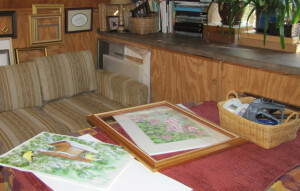 Drawing and painting in the studio is a joy as I am surrounded by collections of birds’ nests, dried wildflowers and have visiting birds (and squirrels) outside my often-open door. Sometimes they even venture in for a short visit. 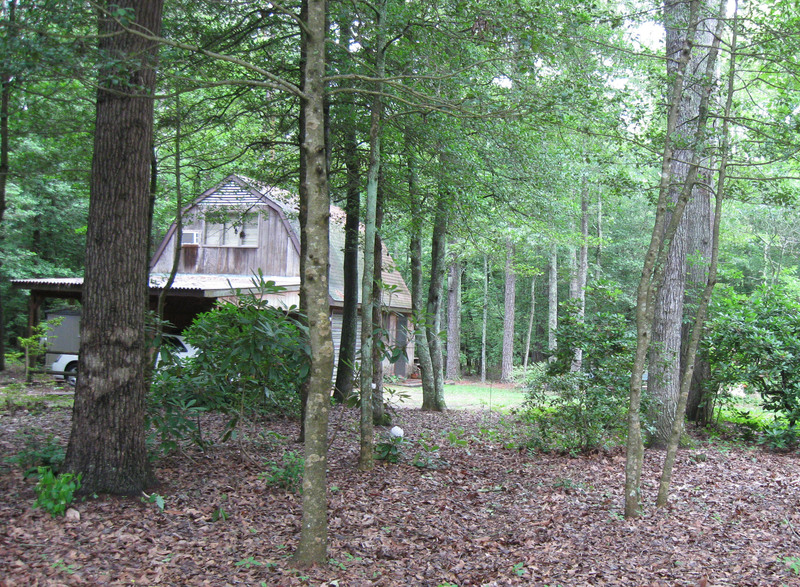 The forest is outside my window and a woodland path begins at the fish (and frog) pond I view from my porch. 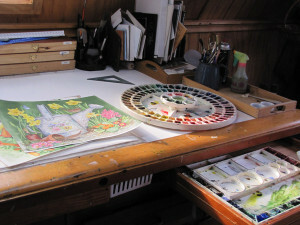 Because I am often on location, the studio is not generally open to the public. Located above the garage and workshop, the studio has a birds eye view of the surrounding woods. Stairs lead up to a small porch that overlooks a frog pond. I often can leave the door open to catch a breeze and hear the neighborhood chickadees. Occasionally a bird flies in or an inquisitive squirrel wanders in but they don’t stay long. All of the walls are unpainted wood and I feel the slanting sides make it feel like a treehouse. There are windows on the north and south ends and a skylight helps bring in more light. The south windows are set above a counter with storage below and several hanging baskets hanging above hold birds’ nests, dried flowers and leaves. I often dry flowers or mushrooms to save for later painting subjects and there are some unusual things in the collection like a dried skunk cabbage flower and lump of shriveled slime fungus! The southwest corner is my computer area with scanner, printer and a digital tablet. 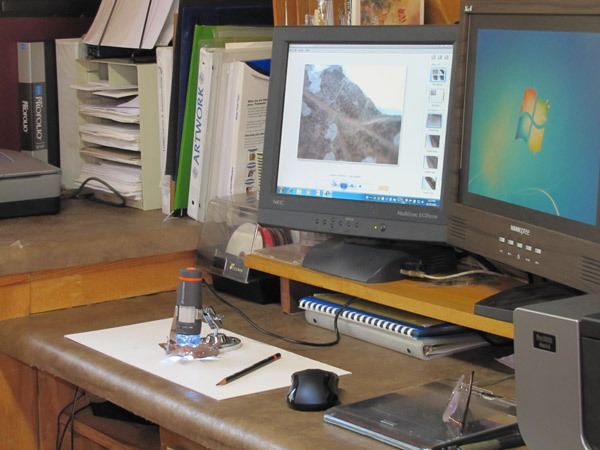 A small digital microscope provides an interesting way to study the specimens I find. While I don’t often spend much time on the computer while in the studio, I find it is necessary for printing promotional materials or doing background research on my subjects. Thankfully my son is a computer professional and keeps my hardware up to date. Many of my original paintings need to be matted and framed for sale at various galleries. As a former professional framer I have a lot of experience cutting mats and assembling frames so I still do my own whenever possible. My Keeton mat cutter is nearly 40 years old but still works quite well! 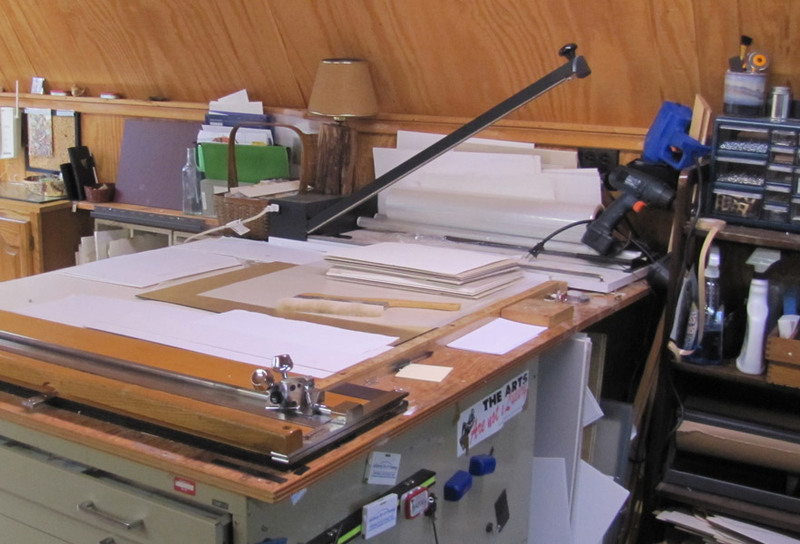 I store the matboard and backing under the matting counter which is held up on one end by my metal flat files that store my papers, finished paintings and prints. Along with the mat cutter the counter also holds my shrink wrapping machine but the large glass cutter is in the workshop area downstairs. Under the skylight is an area I usually use for layout and planning or working on large paintings. One edge of an interior door is attached to the wall and rested on cabinets at the front. I can pull out a section for color mixing and many art supplies from pastels and pencils to inks, watercolors and acrylics are stored in the cabinets and drawers. 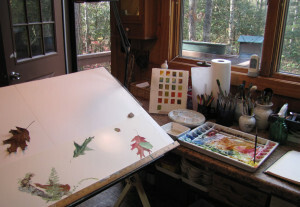 My favorite area is the north window where I can paint and watch the birds visiting my various feeders at the same time. 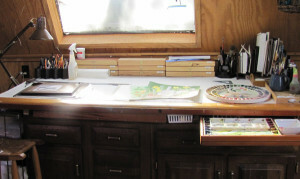 My drawing table sets next to a long counter so I can spread out my palettes, brushes and other necessities and keep them in easy reach. I like a variety of light sources so there are both florescent, incandescent and other lights above the work surface. 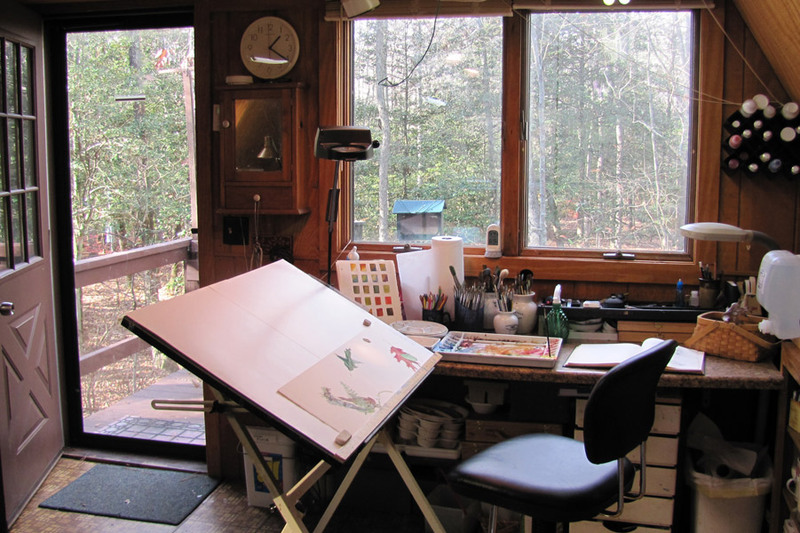 The studio feels like it is in the treetops and I like that the solitude and peace of the forest surrounds me and perhaps sometimes becomes part of my art. 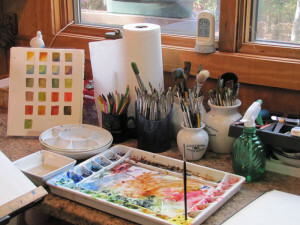 My favorite palettes and water containers are all porcelain to make for easy clean up and I keep extra dishes and bowls for mixing large quantities of color for washes and large paintings.